hair transplant procedure. In FUE, an instrument is used to make a small, circular incision in the skin around a follicular unit, separating it from the surrounding tissue. The unit is then extracted (pulled) directly from the scalp, leaving a small open hole. 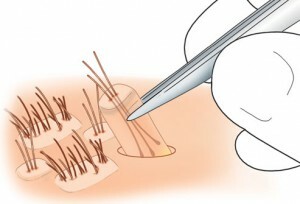 Before the grafts are harvested, tiny “recipient sites” are made in the balding area of the scalp using a fine needle-point instrument. The follicular units are then placed into the recipient sites where they will grow into healthy hair-producing follicles. At least one week before the hair transplantation surgery you have to stop taking any medicine or lotion against hair loss. Since you won’t be able to wash your hair for the 3 days after the surgery. You should take a shower just before coming to the surgery. The night before the surgery you should get a good rest and sleep. While coming to the surgery try to wear casual and comfortable clothes with, button, zip so it will be easy for you to take them off and wear them after the surgery. Before the surgery you should have been done Hepatitis-B, Hepatitis-C and Aids test. Do not get a haircut before the surgery. Before the surgery you have to inform your doctor if you have any chronic illness, had any kind of surgery before, or if you are using any kind of medicines. The morning before coming to the surgery get a good breakfast. Please respect the time of your surgery appointment. During the follicular unit extraction procedure, each follicular unit is removed from the donor area through a small round punch excision of 1mm or less in size. Grafts are then placed into the bald or thinning area. Follicular unit extraction is performed under a local anesthetic and does not require a hospital stay. Your hair transplant surgeon will specify after-care instructions, including what medications to use, antibiotics to take and restrictions on diet and physical activity during recovery. Recovery time is minimal and many patients can return to their work within 1-2 days of treatment.